Peppermint Patties are the perfect confection. Perfect because when you bite through that thin layer of shiny dark chocolate you can almost hear it 'snap'. Perfect because the filling is so soft and creamy, and the peppermint gives a nice blast of 'cool' that tingles the mouth. Now that 'cool' feeling comes from the oil (menthol) in the peppermint. Harold McGee tells us in his excellent book "On Food and Cooking" that this 'cool' feeling is actually because the "Menthol, at low concentrations, raises the threshold temperature at which the cold receptors in our skin begin to discharge: that is, it makes our warm mouth feel cool". 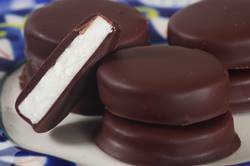 This particular recipe for Peppermint Patties is modeled after York Peppermint Patties, that popular commercially made confection invented by the York Cone Company. Peppermint Patties were introduced in 1940, but only in the Northeast, Ohio, Indiana, and Florida, and it took until 1972 before they were distributed nationwide. Peppermint Patties are a combination of confectioners sugar (powdered or icing), butter, flavorings, and evaporated milk. In order to get that real authentic peppermint taste, peppermint oil must be used, not peppermint extract. Peppermint Oil has a much stronger and more concentrated flavor than peppermint extract so only a small amount of the oil is needed to give these patties that cool and refreshing mint flavor. Unfortunately, peppermint oil is not found in grocery stores. You can find it at some pharmacies, health food stores, or you can order it online from the bakerscatalogue.com. Once the batter is made it needs to be chilled before rolling into balls. Then the balls are flattened into a patty shape and refrigerated again until firm. All that is left to do is to dip each peppermint patty in melted chocolate that has been combined with a little vegetable shortening or butter. The shortening keeps the chocolate shiny even when refrigerated. It also means we do not have to temper the chocolate; a step that most of us like to avoid. These patties will keep in the refrigerator for up to a month and make a unique and welcome holiday gift. Peppermint Patties: Line a cookie sheet with aluminum foil, smoothing out any wrinkles. Lightly dust the foil with confectioners sugar (powdered or icing). In the bowl of your electric mixer, or with a hand mixer, beat (on low speed) the sugar, butter, peppermint oil, vanilla extract, and evaporated milk until combined. Increase the speed to medium-high and beat until very creamy (about 2-3 minutes). Transfer the batter to a bowl, cover with plastic wrap, and place in the refrigerator to chill until firm enough to roll into balls (about an hour). Roll the batter into 1 inch (2.5 cm) balls and place on the prepared pan. Flatten each ball with the palm of your hand until the patties are about 1 1/2 inches (4 cm) in diameter and 1/4 inch (.6 cm) thick. Cover and place in the refrigerator until the patties are firm (at least one hour, or even overnight). Chocolate Coating: Melt the chocolate and shortening in a heatproof bowl placed over a saucepan of simmering water. Remove the patties from the refrigerator and dip, one patty at a time, into the melted chocolate, making sure both sides of each patty are completely coated with chocolate. (You can use 2 forks or a chocolate dipping fork.) Let any excess chocolate drip back into the bowl and then place the patties back on the foil. Once all the patties have been dipped in the chocolate, return to the refrigerator to chill until firm (30 - 60 minutes). Store in the refrigerator in an airtight container (separate layers with parchment paper or wax paper) for up to one month. Makes 25 - 30 patties. Preparation time 90 minutes. McGee, Harold. 'On Food and Cooking'. A Fireside Book. New York: 1984. Rosen, Michael J. 'Baking From The Heart'. Broadway Books. New York: 2004. Wilson, Dede. 'A Baker's Field Guide to Holiday Candy & Confections'. The Harvard Common Press. Boston: 2005.